This item is not available during auction period. Size: 37.4 x 33.7 inches. Condition: In good condition. Printed on strong paper. A working chard, with several annotations in lead pencil and ink. 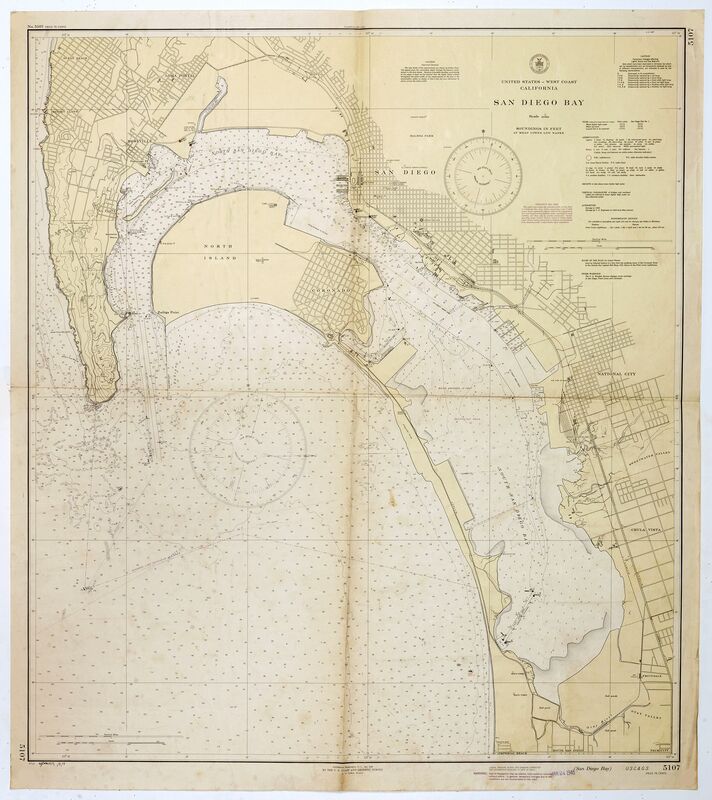 Nautical chart of San Diego Bay of 1945. Printed in black, yellow and purple the "Seaward limit defensive sea area". The water area within the indicated limits on this chart is a Defensive Sea Area. Unless proceeding under United States naval supervision, vessels shall not be navigated in this area except during daylight under conditions of good visibility, and than only by specific conditions. In lower margin "WARNING : Aids to Navigate may be altered, interrupted or removed without notice. In general, temporary changes due to war conditions are not incorporated on the chart. San Diego had, long before the war, become a "Navy town" because of the many naval and Cost Guard facilities here. Early in the war San Diego was chosen as the new headquarters of the Pacific Fleet after the headquarters left Honolulu. During the first weeks of the war fears of an invasion and/or air attacks were strong here as they were elsewhere in California. At that time the city's only air defenses were the guns on the ships in the harbor. This was soon corrected as the Army moved in as soon as it could to provide adequate air defenses. Arrangements were made between the U.S. Government and the Government of Mexico to allow joint teams of U.S. Army officers and Mexicans Army officers and soldiers to patrol the Mexican peninsula of Baja California. The teams were platoon-size units and patrolled all the way to the southern tip of the peninsula. There were persistent rumors early in the war that the Japanese might have secret air bases in Baja California, but no evidence of this was ever found. The American officers were required to wear civilian clothing and all U.S. markings had to be removed from U.S. Army vehicles and other equipment to accommodate Mexico's neutrality laws.